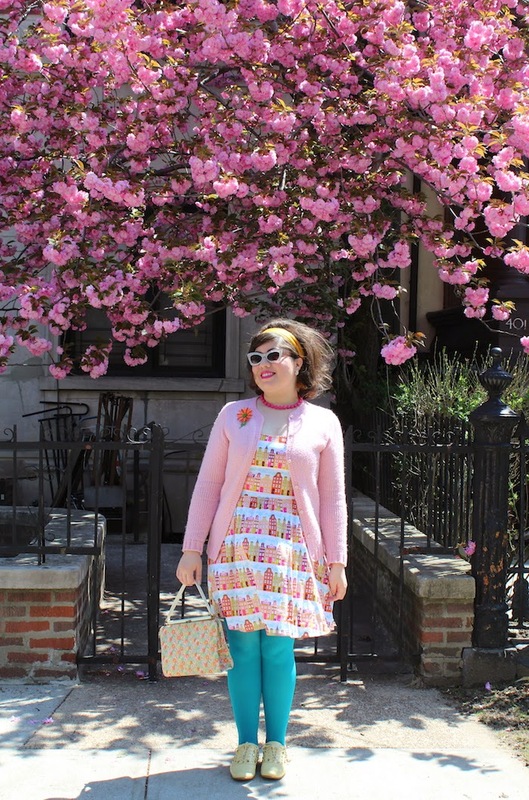 These photos are actually from last spring, but they have me excited for upcoming sweater weather. Although I'm from Texas, I'm not a fan of summer. I burn easy and feel like a sweaty mess. Fall is my jam and you can see I enjoy a myriad of colors each and every season. P.S. The word "myriad" will forever remind me of Heathers. I'm currently on my way to Massachusetts for the Brimfield Antique Show, the biggest in the U.S.! I'm typing this on my phone so forgive any typos you might see. I'm super excited!!! I love Heathers so much. I made my boyfriend watch it for the first time a couple of months back, and he just did not get it. Doesn't stop me from quoting it all the time. "Jesus, Heather, what's your damage?" I'm also excited to bust out my (somewhat less colorful) sweaters. Now that I'm in the mood for fall, it seems like summer is really dragging its feet, but I'm already drooling over tights and wool everything in preparation. I love your 60s babydoll take on fall dressing, it seems like a great way to leave summer behind. Your hair with this is adorable! Thank You! This is from last spring and I badly need a haircut. I miss this short style. Adorable! Love your color palette. This outfit is perfect cool-weather inspiration. 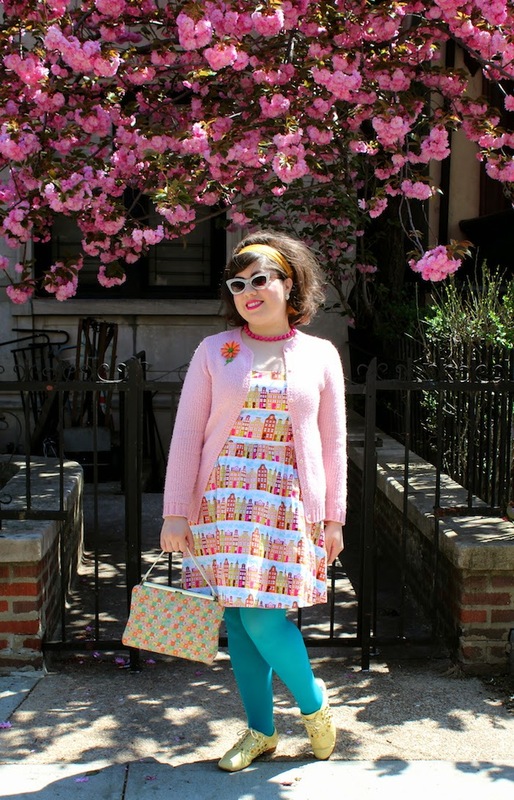 I need to try that pink-and-teal combination like YESTERDAY. Uber cute!!! 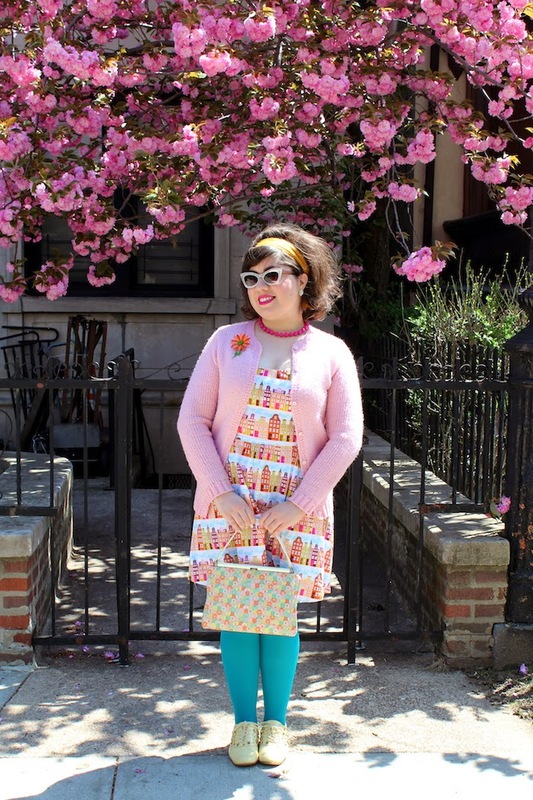 I madly adore the sweet, fun, cheerful colour palette at work in this wonderful outfit.